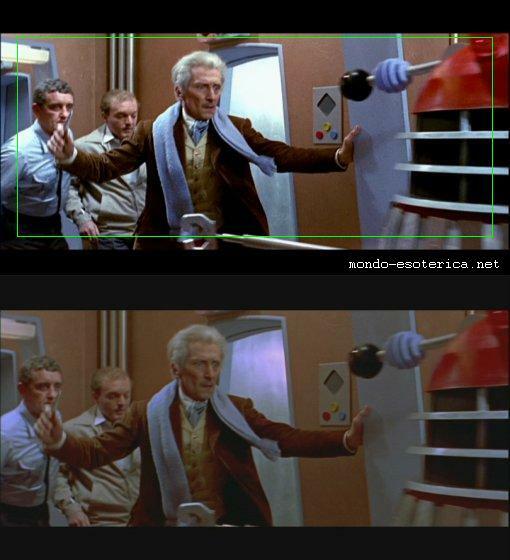 Peter Cushing stars in Amicus' entertaining second Dr. Who film. Optimum UK R2 DVD from the Dalek Collection. P.C. Tom Campbell is attacked by robbers raiding a jewellery store. He rushes to the nearest police box and discovers that he has fallen into the Tardis of Doctor Who (Peter Cushing). The Tardis materialises in London, 2150 and the travellers find the city broken and in ruins, it soon emerges that the Daleks have invaded the planet. The Doctor's niece and granddaughter are rescued by Wyler (Andrew Keir), a member of the human resistant movement, while the Doctor and Tom are captured by the Daleks and taken to their space-ship. It emerges that the Daleks have constructed a huge mine near London, but for what purpose, and can they be stopped? After the sucess of Dr. Who and the Daleks (1965), Amicus quickly began work on a sequel. David Whitaker again scripted an adaptation of one of the TV serials and this time around the film is darker, scarier and generally much better - the general storyline is much more detailed than before, with a solid and relatively plausible explanation, while the characterisation is much stronger. Again, the film is targeted at the younger U-rated market, and there are several comedy scenes, however for the most part the film is quite strong with a lot of often quite vivid deaths and violence. 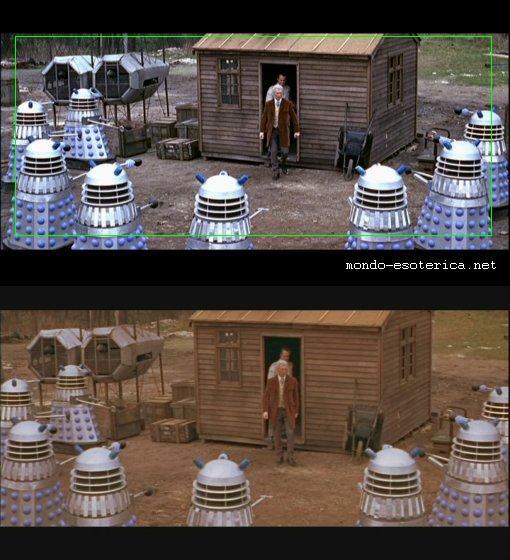 The Daleks are much better rendered here, gone is their banal dialogue from the first film, instead they are enigmatic, menacing and actually scary. The story is paced well and builds to a very good climax with a fitting ending. The earth bound setting gives this film a real advantage over the previous alien world entry, and allows the use of exterior shoots with much grander scale - good use is made of matte paintings to create a ruined London. 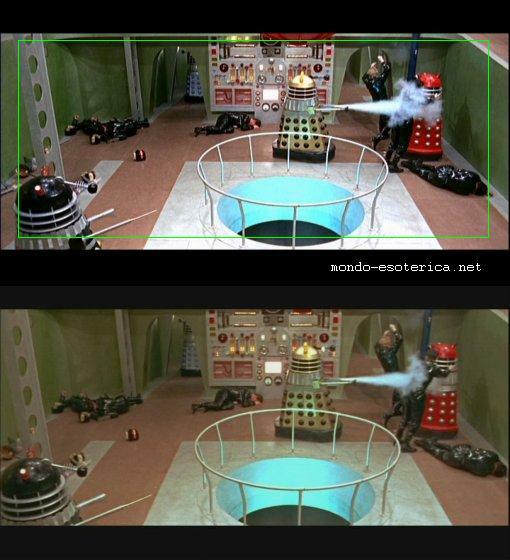 The sets are nicely detailed, with the Dalek base awash with dials, levers and flashing lights. Director Gordon Flemyng's use of the camera is very nice, following the Daleks up ramps and around their base with some nice long takes. Composer Barry Gray, who worked on many of the Gerry Anderson series, including Stingray (1964) provides the movie's theme tune and it should sound familiar to fans of these series. Peter Cushing reprises his role from the first film, and gives a good performance, toning down the sometimes disliked eccentricity of the first film. Bernard Cribbins, who starred alongside Cushing in Hammer's epic She (1965), gives the film some comic relief, while Andrew Keir gives a very good performance as the gruff rebel Wyler, who is stuck with the Doctor's granddaughter - ably played again by Roberta Tovey. Daleks' Invasion Earth 2150 A.D. is all over a better film than Amicus' first Dr. Who entry - it is better written, much darker and more enjoyable. Fans of the TV serials should enjoy this, provided they can accept the Who-lore changes made in the first film and retained here. It comes recommended to anyone looking for some entertaining cinema. Bernard Cribbins - a comedy actor who starred in several of the popular Carry On films. Directed by anyone interesting? Gordon Flemyng - a little known British director who also worked on the first film in this series. Is it scary? Some scenes might scare. Any violence? Some rather violent deaths, although no blood. The picture quality is good with strong colours, although some noticable grain throughout. There is infrequent print damage, a slight orange fringe at the bottom of the screen in some scenes. Some scenes have a higher contrast with notably stronger colours. 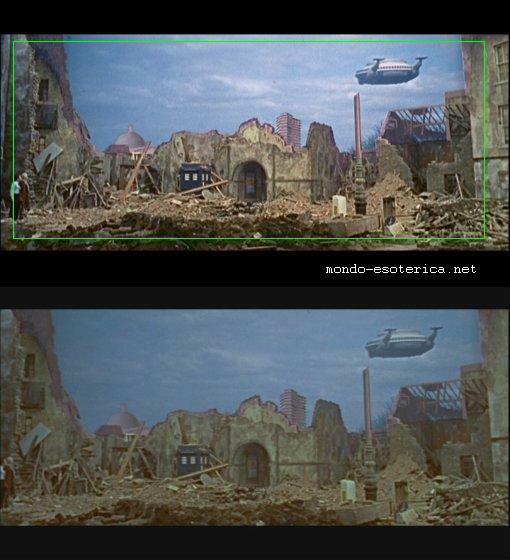 Comparison images (lower) courtesy of Warren Andrews and are from the UK R2 WB DVD. Extras This disc includes the 1995 Dalekmania documentary about the films and including various interviews. Interesting although over-long and rather dated, with some rather poor quality footage in several scenes (57 minutes). More extras in the boxset. Other regions? Now OOP UK and US boxsets include the film. These sets include theatrical trailers not present here. The print presents the opening scene in the correct place before the title sequence. An enjoyable film with good plot and direction. Recommended. Good looking print and audio. Interesting documentary, although lack of trailers is disappointing.